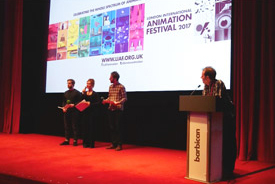 LIAF 2017 – our 14th year and it was an absolute pleasure to be able to present to you so many wonderful animated films of very genre, technique and style, proving that independent animation worldwide is thriving. The imagination and energy that these animators and their small teams possess who have made these films is utterly boundless. We couldn’t have put together such a large and varied festival without them. 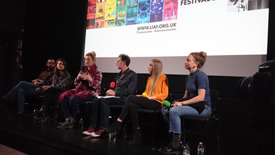 We’ve been privileged over the duration of our Festival to have welcomed some amazing Animators, Producers and Creators onstage with us to take part in insightful discussions and Q&A’s. Anyone who joined us on our Opening Night Gala would have been privy to something very special with our David OReilly Q&A and screening. We’re also really honoured to have had our two guests from Barcelona – Ana Santos and Noel Palazo showcasing their film festival Punto Y Raya – the world’s most abstract film festival with two talks and screenings. We welcomed two guests from Poland – Maciek and Aga from KinoManual who ran a ‘Direct’ Animation Experimental Workshop for 20 very lucky participants. They created a wonderfully batty three minute film which you can take a look at below. We had some inspiring and feisty panel discussions. In particular the Q&A that followed our Animated Documentaries screening (with Sinem Vardarli, Luca Schenato, Jocie Juritz, Harriet Croucher & Anna Ginsburg) and our Female Figures Q&A (hosted by Abigail Addison from Animate Projects, who was in conversation with Dr. Steve Henderson, Sarah Ann Kennedy, Kim Noce & Alys Scott Hawkins). As well as many other filmmakers who joined us from all over the world – and those who joined us from closer to home, to introduce their films. A huge thank you to all of you for sharing your thoughts and insights with us. Of course we wouldn’t have been able to get this festival up and running without the help of so many wonderful colleagues, friends, sponsors and funders so we’d like to say a very heart-felt thank you to The Arts Council and the Polish Cultural Institute for funding support, The Film and Video Workshop and in particular Simon Oatley for general all-round support in so many ways, The Elf Factory, RebusFarm and Toon Boom for their generous sponsorship of our festival prizes. Nick Cinelli and Nelly Michenaud and their incredibly talented teams from the National Film and TV School made two wonderful festival trailers for this years’ Festival. Do give them a watch… links below. The simultaneously painstaking/delightful task of deciding this years’ Festival Award-winners was tackled with gusto by our Festival Juries. Suzanne Buchan, William Bishop-Stevens and Luiz Stockler judged our International Competition Programmes (all eight of them!). Emma Calder and Britt Raes took on the task of judging out annual Abstract Showcase, and Lilith Silver, Jocelyn Goldstein, Reuben Carter and Edwin Green for our two programmes for children – Amazing Animations and Marvellous Animations competition. 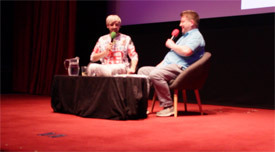 We’d also like to thank all of our festival venues but in particular the Barbican Cinema Team who once more pulled out all the stops to help us make sure the operation runs as smoothly as possible, especially Tamara Anderson, Robert Rider, Daniela Fetta, Ellen Reay- and all of the ushers, box-office and bar staff. When you work on a short film festival of our size, with several-hundred short films, there’s a huge amount of formatting and logistics involved in the screening process, but the Barbican projectionists made sure that everything ran perfectly smoothly. So a massive “thank you” to Matt, Thomas, Jonathan and Tim, who worked tirelessly behind the scenes to bring these animated gems to the big screen. LIAF is a year-round operation and as ever there’s a small but incredibly dedicated and talented team of workers who have been working long hours to bring LIAF to you and we have the great pleasure in thanking: our irrepressible Festival Co-Director – Malcolm Turner; Claude our Screening Compiler, Mandy Smith our Festival Producer, Designer and marketing person; Anna Gregory who co-ordinated our animation workshop as well as many other things. And thank you to all of our hard-working volunteers especially Anna and Leah and many, many other friends and colleagues who have helped us along the way. Once again, thank you to everyone who joined us and we hope to see you back here next year! This entry was written by admin, posted on December 20, 2017 at 8:10 pm, filed under News.